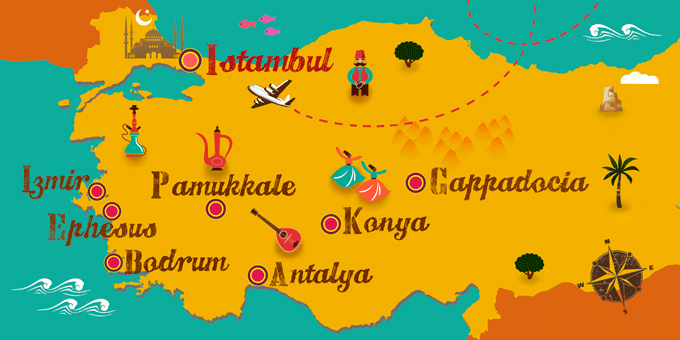 Turkey is a huge country, so it's a good idea to plan your trip before going. It won't be an easy task to choose where to go, however. Luckily, Turkey covers such a wide variety of destinations and possibilities that it is always possible to find something for everybody. All our tour packages in Turkey start in Istanbul, a tremendously exotic place which is closer than you think: a real mix of Europe and Asia, both in terms of architecture and culture. A trip to Cappadocia is not to be missed, with its underground cities and fairytale landscapes. We can also add to our itinerary a dip in the Aegean Sea or the cold waters of the Black Sea, climb to the snowy heights of the Taurus mountains or cross the Rose Valley in the Anatolian Plateau. This is all served with an accompaniment of local hospitality and simple yet tasty gastronomy. Visa is issued on arrival in the country or online at the following link: https://www.evisa.gov.tr/es/. Price approx 15Û.